The professor who launched Maine's first dedicated white shark study says it's part of a growing body of evidence that the predatory sharks are in the Gulf of Maine. That’s three sharks identified in three years by a single receiver in the gulf, this one a 12-footer. 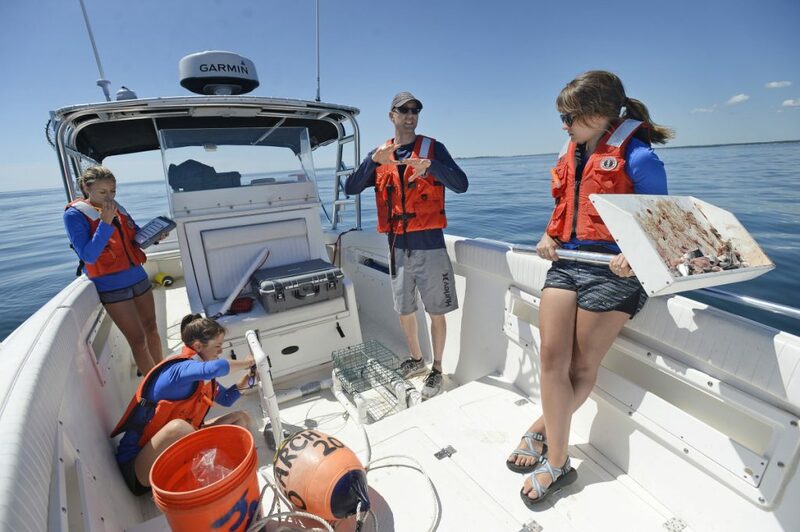 For the third time in three years, a great white shark has been detected in southern Maine waters by University of New England professor James Sulikowski. This photo taken from video shows a great white shark off the coast of Cape Cod, Mass. UNE’s receiver detected a great white Sept. 2 near Stratton Island in Saco Bay. Sulikowski learned last week that an acoustic receiver detected a 12-foot female white shark on Sept. 2 off Stratton Island, about 3 miles from Old Orchard Beach. The shark was tagged with a transmitter on Cape Cod by Massachusetts biologist Gregory Skomal as part of a five-year study he’s conducting on great white sharks. Sulikowski said muscle tissue samples collected from the 12-foot shark – called “Cool Beans” by Skomal’s team – when it was tagged will indicate if the shark is pregnant. Two years ago, Sulikowski’s receiver identified another tagged white shark off Kennebunkport. And in September 2017, it detected a 12-foot female white shark near Stratton Island. Over the summer, Skomal was tracking 134 white sharks using acoustic and satellite transmitters he affixed to the dorsal fins of the predatory sharks, which have exploded in number off Cape Cod in the past decade since the seal population rebounded. The first shark fatality in Massachusetts in 80 years occurred this summer off the coast of Newcomb Hollow Beach in Wellfleet when a 26-year-old man was bitten by a white shark and later died at a hospital. 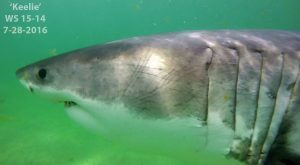 Meanwhile, Sulikowski in July launched the first dedicated great white shark study in Maine when he put out two underwater cameras off Old Orchard Beach in hopes of capturing video of white sharks. So far those underwater cameras have not detected any white sharks. But Sulikowski said the acoustic receivers add to a growing body of evidence that great white sharks spend time in the Gulf of Maine. The white shark detected by the UNE receiver on Sept. 2 was on the south side of Stratton Island in Saco Bay, a rocky island that is a known “seal haul,” where harbor seals pull up on the rocks by the dozen. In July, Sulikowski received a drone video of a 12-foot white shark circling the floating carcass of a minke whale off Portland. Sulikowski said he will continue to deploy his underwater cameras for another month.